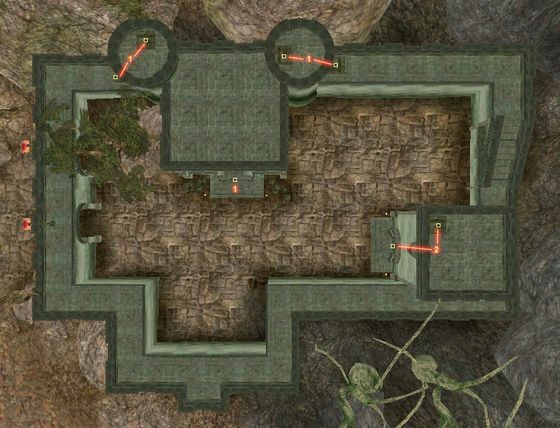 Located southeast of Balmora, Moonmoth Legion Fort is the center for Imperial control in the region. The Fort offers an Imperial Cult Altar, apothecary, an enchanter, a smith and a trader. In the Prison Towers, Solea Nuccusius guards the jail and the Evidence chest for the region. Radd Hard-Heart is the Knight Protector and commander of the Fort. He acts as the source of most quests relating to the legion, but Larrius Varro, who seems to be an agent of the government, is having trouble with some bad people and will reward you for creating a bloodbath. Moonmoth Legion Fort is quite close to Balmora, so you can use fast-travel options from there. The Silt Strider can take you to Ald-ruhn, Seyda Neen, Suran and Vivec. The Foyada Mamaea leads you east to Ghostgate and beyond. Caius Cosades sends you here to get some "Essential Supplies" for your adventures from two of his friends (Somutis Vunnis and Crulius Pontanian) during the quest Meet Sul-Matuul. 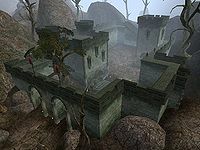 The Dwemer ruins of Arkngthand are located on the hill directly east of the fort. Meet Sul-Matuul: Travel to the northern coast to find out more about the Nerevarine Prophecies and how it relates to you. Larrius Varro Tells a Little Story: Perform a "little favor" for Larrius Varro in Moonmoth Legion Fort. This page was last modified on 16 November 2018, at 06:31.